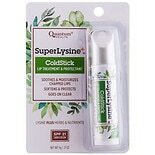 Shop Quantum Health Super Lysine+ Cold Sore Treatment (.25 oz. ).25 oz. To help heal the pain, discomfort and redness a cold sore can cause, turn to lysine cold sore treatments. Lysine is an amino acid that has been shown to aid the prevention and treatment of cold sores. 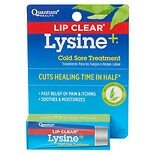 Some lysine cold sores ointments also have other ingredients to soothe and speed healing. 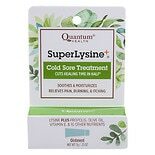 You'll find lysine cold sores treatments and other options for cold sore relief here at Walgreens.com. Various cold sore relief products can meet your needs, whether you'd prefer a one-day treatment or a drying gel. Some cold sore medications are available in easy-to-use pumps, sanitary applicators or tubes. And for the pain that can accompany cold sores, try a topical analgesic that can offer quick relief. If you also suffer from occasional canker sores, there are ways to alleviate the stinging and swelling. There are canker sore patches, gels and many more canker sore relief products than can alleviate discomfort and help you to heal. Some canker sore treatments can even form a barrier to speed the healing of the canker sores.